Carnival celebrations have already began, considering they will end 40 days before Easter, which is on March 31 this year – pretty early! The first events will start this weekend – January 19th and 20th – but several other main festivals, such as the Viareggio Carnival, will continue later, until the beginning of March. The carnival is a chance for fun for the entire family and if you’re in Tuscany in the next few weeks, I strongly recommend you participate in at least one carnival Italian-style parade. Therefore, wear your fancy clothes and prepare to discover the Tuscan cities under a shower of colorful confetti! The next few Sundays you’ll find the magical town of San Gimignano celebrating carnival. Papier-mâché floats, music and masked groups will bring life and color to the historical center of the lovely Tuscan Manhattan, as the city is defined due to its city skyline. It is a perfect excuse to visit San Gimignano in this period: the city is even more enchanting in winter! When: 20th, 27th of January and 3rd, 10th of February 2013, starting from 3:30pm. Borgo San Lorenzo, one of the main towns in the beautiful green valley north of Florence called Mugello, proposes four Carnival events on upcoming Sundays. The parades will take place in Piazza Dante, in the center of the city and entry is free. When: 20th and 27th January and 3rd, 10th and 12nd of February from 3:00pm. 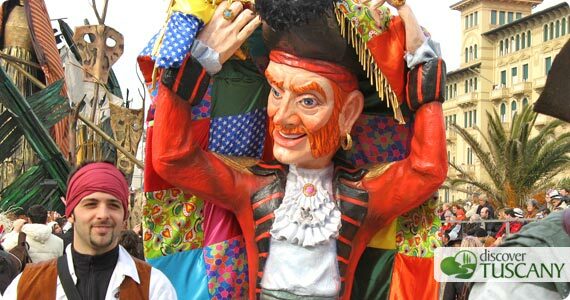 On Sunday, January 27 in San Mauro a Signa, a small town about 15 km from Florence, there will be the traditional Fair and Carnival, with a parade of floats and masks. When: January 27th from early afternoon. In the tiny center of Vitolini near Vinci you’ll find the “Children’s Carnival”, a free masked parade dedicated just for families. When: 20th January, 27th January, 3rd of February 2013 from 2:30pm until late evening. Masked groups, parade of floats, street bands and free tastings are the ingredients of the Carnival at Foiano della Chiana, near Arezzo. Children under 12 years enter free of charge, while adults pay €8. You can get to the Carnival of Foiano with a free shuttle bus which leaves from the Val di Chiana Outlet Village every 15 minutes. In Piazza Garibaldi you’ll find entertainment for the young ones and rides, all with free admission. More information (in Italian only) on the official website. When: January 27th, 3/10/17 of February, March 3rd. The event starts at 3pm. The Viareggio Carnival will have its first run on February 3rd and it will continue until March 3rd. It’s the most famous and spectacular Carnival in Tuscany, renowned in the world for its colossal allegoric floats inspired by international politics and current events. Read more details about the Carnival in Viareggio here. When: 3rd and 17th of February, 3rd of March at 3pm; February 10th at 4pm and February 12th at 2:50pm. Parades, masks and small shows organized by local schools will animate Santa Croce sull’Arno, in the province of Pisa, in February. When: February 3rd at 3pm, 9th of February at 9pm and the 17 of February at 3pm. In Arezzo on February will take place the traditional Carnival dell’Orciolaia, with a parade of floats and celebrations in the streets of the city center. When: 10th and 17th of February 2013.